In the previous pAsuram, AzhwAr told his heart to carry out service to emperumAn. In this pAsuram, he tells his heart that emperumAn is such that he destroys enemies, he is sweet and he is the ordained entity for us and is the most apt entity for us to carry out kainkaryam. nenjE – Oh my mind! adhu sonnEn – I have instructed (you) this previous meaning. sUttAya nEmiyAn – emperumAn has the divine disc, which not only annihilates enemies but is also suitable for being worn as an ornament. thol arakkan innuyirai mAttE thuyar izhaiththa mAyavanai – one who has the amazing power of standing in close proximity to rAvaNa, the demon, and troubled his life which rAvaNa was protecting very carefully for a very long time. Just as it is mentioned in SrI rAmAyaNam yudhdha kANdam 60-3 “brahmadhaNda prakASAnAm vidhyuth sadhruSa varchasam I smaran rAghavabANAnAm vivyathE rAkshasESvara: II ” (the kind of demons, rAvaNa, felt distressed thinking about the arrows of SrI rAma which have the lustre of the sceptre of supreme entity and the radiance of lightning), did not rAvaNa suffer so much, thinking about the powerful, divine arrows of SrI rAma which carried his name, that he felt suffocated by the weapons and arrows that he was carrying! Itta veRi koNda thaN thuzhAy vEdhiyanai – emperumAn, who wears the garland of thuLasi which has so much of fragrance that one would think whether it is the repository of all the fragrance available, and who is spoken of in the vEdhas (sacred texts). nenjE aRi kaNdAy sonnEn adhu – Oh dear heart! I have told you this. Know about it. 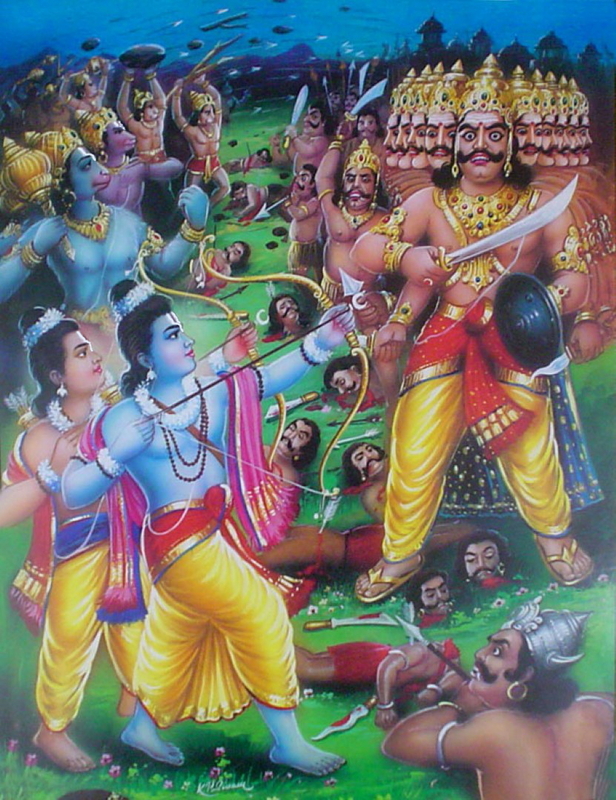 Since emperumAn destroyed rAvaNa, he has the nature of annihilating enemies; since he is wearing thuLasi garland, he is sweet; since he is spoken of in the vEdhas, he is the ordained lord. AzhwAr tells his heart that for these reasons, know that he is the one for whom kainkaryam is to be carried out. This meaning is not easily available to anyone; know this. We will take up the 67th pAsuram next. This entry was posted in iyaRpA, periya thiruvandhAdhi on January 17, 2019 by T N Krishnan.